They are letting the Cat Out! Victoria and Don Sweet show the techniques that produce Big Cats where ever they fish. 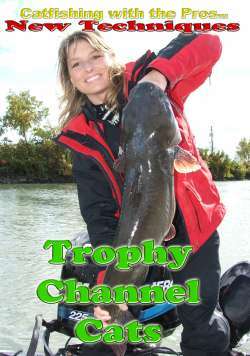 While most of their fishing is for Channel Cats, the techniques work effectively on Blue and Flathead Catfish as well. They are letting the Cat Out! Victoria and Don Sweet show the techniques that produce Big Cats where ever they fish. While most of their fishing is for Channel Cats, the techniques work effectively on Blue and Flathead Catfish as well. When the fishing is tough, it works even better. During 2004 Victoria produced one of the three top Catfish in Michigan, and the top entry for 2005. So sit back and relax and learn how to catch larger cats, and entice stubborn ones under the toughest conditions.